Enjoy 2 premium tastings at high quality Napa Valley wineries on this seven hour, guided tour from San Francisco. Sip bold Cabernet Sauvignon and crisp Sauvignon Blanc while learning what it is that makes California wines truly unique. 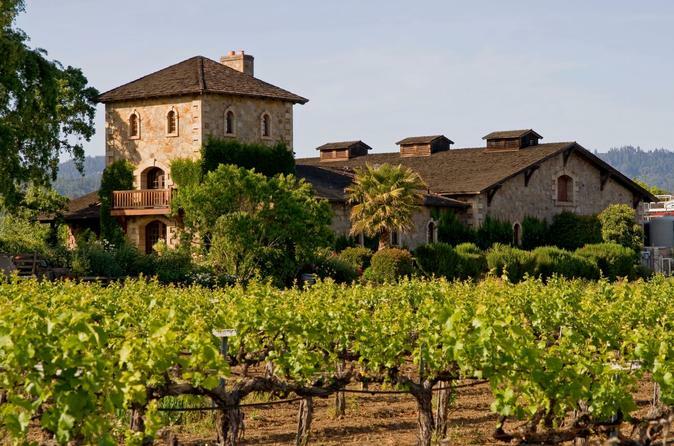 Enjoy an amazing lunch stop in wine country with the help of a trusted, expert guide. The Napa Valley has been at the forefront of New World wine making ever since it shot to renown during the famed Tasting of Paris in 1976. Today, the valley host more than 300 wineries across 37 miles of scenic vineyard, rolling green hills and rustic farms. With literally hundreds of styles and varietals available within a short drive of one another, sorting through so many options can feel like a challenge for even the most experienced connoisseur. Luckily, this tour makes the choices for you. This tour starts from a convenient central meeting point in San Francisco's Union Square. After meeting the driver, you will be ushered aboard a comfortable coach where you will meet your guide and take your seat. As you head out, your guide will fill you in on some of the finer points of San Francisco history and trivia as you head over the bay over either the Bay or Golden Gate Bridge and make your way north to the Napa Valley. After approximately an hour of driving, you will stop at you first premium winery for a 45 minute tasting of fine wine. Shop for souvenirs and listen closely as you discuss how a beverage with a history tracing back more than 6,000 years is perfected into the many styles you see today. Both fine tastings are included with the price of the tour. After your first tasting, you will stop for lunch where you can purchase sandwiches, olives, cheese and of course, more fine wine before heading to your second, and equally delicious, winery to finish the tour. Once completed, you will return to the coach for a roughly 1.5-hour drive back to San Francisco where you will be dropped off back at Union Square well before dinner time.